My dad initially did the bike-riding lessons. Mostly those involved a bit of running alongside me, a quick push, and then the installation of training wheels. But it was my mom who got me going without the training wheels. She was frustrated, see, because I was in that stage where I could ride just fine so long as I thought someone was holding onto the bike to keep me upright. But as soon as I looked back and saw I was actually riding solo, I’d fall over immediately. Get on that goddamned bike and ride it! Who taught you how to ride a bike? I was watching the opening credits of an episode of Scrubs, an unusual take on the sequence where J.D. was portrayed as a suave spy-type character and the other docs and nurses were his cohorts or (in Kelso’s case) the archvillain. Usually the show’s credits sequence is a short snippet of Lazlo Bane’s song “Superman” over a quick cut-scene of the characters handling an X-ray as the camera pans across a hospital room, with the text credits following superimposed over the ongoing episode scenes, so this credit sequence was really something and I was fully engaged. I really wanted to see where that Scrubs sequence was leading but instead I had to clean up feline spew with toilet paper, so I got to feel the warm squishiness of it and to fight back the two cats who had since gone into Hunter/Killer mode because of the puke smell. All I could think at that moment was, if Katharine were here I would ask her to clean this because the gag-reflex dry heaves would be amusing and I didn’t even twitch over it. Flex, meantime, was back at his food bowl, obviously starving from his recent feat of gastrointestinal gymnastics. If, like me, you want to be a raging nerdboy. dodgeball, Google’s entry (via buyout in 2005) in the “mobile social software” arena. You “check in” via your mobile phone. dodgeball maintains a history of your check-ins and notifies anyone you designate as a friend of your location. You can receive notices by email and/or by SMS, but keep in mind if you have more than a few friends on this service, your message volume can go insanely high. My dodgeball profile—as I write this, I’m the No. 1 check-in geek for the Seattle area over the last 10 days. Twitter, so you can at any time answer the simple question, “What are you doing?” Also updates people you designate as friends. You can send in updates via SMS, IM (via AIM), the Twitter web site, or with a couple of stand-alone applications (Twitterrific for Mac OS X, Twitteroo for Windows). My Twitter update history. Update 23:11: No idea when it started working again, but dodgeball is available now. UPDATE Wed 05/30/07: I won’t be using dodgeball any longer after May 31. Won’t delete the profile, at least not right away, but I won’t use the check-in function either. I started this job on Dec 07, 54 days ago. It took nearly a week for my initial set of network credentials to be created and to propagate fully so I would be recognized on a small part of the dozens of systems I access on a regular basis. The second set of credentials, the more important ones, took another two weeks beyond that to be created, and then nearly a month to be created correctly. Just tonight, in fact, am I FINALLY set up to do the majority of my job under my own logins and without having to bug anyone else about signing on or off or otherwise doing various tasks and such I should have been able to do in late December. But also, damn, because now I can do everything directly and won’t be able to claim access crippling on anything. Nice design for the Utah commemorative, the Golden Spike scene. My new home state’s design, fish with Mt. Rainier. I use oof! when I get sucker-punched. I like their usage better. One, it was strange to be driving on mostly dry roads. Even though we haven’t had continuous snow and rain for the last several weeks, what snow lingered (and the “don’t like the weather, check in five minutes” style of this winter’s storms) left the roads wet all the time. Two, the sound of my coat sleeve rustling against the seat-belt strap was really loud in my left ear. I’ve worn this coat dozens of times, never noticed the sound before. Three, the rush of air past the edges of the windshield at freeway speed. Sounded like we were in a wind tunnel. No stereo nor conversation to cover it up, I guess. Four, my car’s brake shimmy has worsened a bit. I need to have that checked because it annoys the hell out of me, even though (the service folk say) it isn’t wearing the brakes unevenly. I have been home nearly an hour. I have a repeat episode of M*A*S*H (I’m sure I’ve seen it several dozen times by now, it’s the one where B.J.’s buddy plays practical jokes that get B.J. arrested) playing on the TiVo and about three minutes ago I put a batch of sugar cookies in the oven. I didn’t mix up the dough, of course. It’s one of those packages of dough you crack into little squares and throw on a cookie sheet, quick and dirty. Oh, and also I just took a couple of store-brand night-time cold meds, because I have the slightest hint of a sore throat and that’s how every cold I’ve had in the last 10 years started. So I’m being preemptive and inhaling meds at a pace approaching absurdity. I’m hoping the combination of a slight sugar rush from a couple 1-inch cookies, the outpouring of heat from the oven when the baking is finished, and the two liquid gelcaps I just snorked will induce a glorious state of somnolence. Their guide to the new park on the Seattle waterfront. Includes a zoomable map, descriptions (with audio), photos, park history, etc. I installed iTunes on my PC at work so I could listen to a couple gigs of my own music library when I don’t have my iPod with me. Right now there are two shared libraries available to me. One is comprised almost entirely of TV shows and video clips, 297 items totaling five days’ playing time and 50GB; the other is all music, 4700 items and change totaling more than 15 days’ playing time and nearly 22GB. I of course fired up a connection to the second library and in my desire for something interesting to play (I did indeed forget my iPod tonight), I decided to use iTunes’ genre-browsing function. I’m intrigued by Nerdcore Geeksta but the one song classified under that genre doesn’t play, counts out about 3 seconds and then skips. I’m disappointed. One of my favorite things about snowfall is the general ambient light that pervades the night sky. The same streetlights and house lights appear so much brighter with all the snow to reflect the light, and a non-directional glow fills the sky. Flickr: Don NunnLooking south on Mill Creek’s Main Street. Flickr: Don NunnAnd looking north. Flickr: Don NunnEvidence of my return from work, natural light via the Treo (and iPhoto’s Enhance tool). Good thing I don’t rob banks for a living. I left my house at 17:00. Normally the drive to work takes about 30 minutes, including the occasional stop for gas or at the post office or whatever. Tonight, we finally pulled into the campus parking lot at 19:00. Oh sure, I thought we were doing all right. It only took half an hour to get from the Thrasher’s Corner area to NE 85th St in Kirkland. Traffic on I-405 was slow but moving continuously. And then we reached 85th and 17 minutes passed while we rounded the curve off the freeway and onto the surface street. It took 53 MORE MINUTES to clear the roughly three-and-a-half-mile stretch from NE 85th St at I-405 eastbound to the right turn at 148th Ave NE and south to 5600. This metro area drives me INSANE sometimes. Flickr: Don NunnWe can see the traffic light that marks the work campus entrance—it’s the little red smudge in the middle of this photo—but we move only one car length about every 2 or 3 minutes. Flickr: Don NunnWoke up to a dusting on the buildings, cars, and lawns, despite the doom-and-gloom forecasts all day yesterday. Now in the last five minutes, the accumulation has begun—we’ll see how far it goes. Flickr: Don NunnThe west parking lot and the tracks of a few cars. Pavement’s barely covered over. They say we could get a couple inches out of this storm, “locally heavier”—I like the ambiguity. Flickr: Don NunnStrangely pellet-shaped bits of snow falling at quite a clip. The pellets bounce a lot when they hit the ground. Who knows if this will get any airplay at all—I imagine most folks who read this site regularly probably aren’t big Google Calendar users, but I use it all the time, so it’s worth talking about. For about two months now I’ve had trouble with Calendar rendering on both WinXP SP2 with IE 6, 7, and Firefox 2.x; and on Mac OS X 10.4.x with Safari and Firefox 2.x. Today I hit on what I think is a solution (or at least the source of the problem for me), as I’ve had no trouble in the two WinXP browsers I use at work since I made this change. I went into Settings and clicked Show weather based on my location: to Do not show weather. Since I did that about two hours ago, I’ve been able to load Calendar in WinXP SP2 successfully in IE7 and Firefox 2. Since I’m still at work, I haven’t had a chance to try this on an OS X machine; I’ll update this post when I do get home and give it a try. If you happen across this and know of anyone who has had trouble with Google Calendar rendering since about mid-November, ask them if they have weather displays activated and if so, direct them to this post. It may save them from tearing out their hair. See related Google Groups help topic. I posted this as a reply on that topic and also sent it separately to Google via their feedback forms just for grins. Update 03:14: Yep, works fine at home too on OS X with Firefox 2.x and Safari 2.x. Will update again if I notice any changes. It figures I just switched away from Cingular last month. This will definitely be a second-generation gadget for me, because I’ll want to see how the early adopters do with such a device in the real world. I am, of course, looking gleefully forward to the day one of the nearby Apple Stores actually has an iPhone in stock. I only hope I’ll be able to evaluate it objectively instead of rubbing it lasciviously against my person. Marvin the Martian looks like a USC Trojan. It makes possible quizzing about one’s whereabouts and the answering of the questions no matter where one is. I am camped out for a time in the restroom. Katharine, who has noted my absence from MSN Messenger, has queried by SMS to find out just what I’m doing. And I’ve told her exactly where I am, because I think she’ll get a laugh out of it. Today’s Seattle Times has an article about Michael Manfredi, a New York architect who with his partner and wife Marion Weiss won the contest to design Seattle’s Olympic Sculpture Park, which opens January 20 along the waterfront at 2901 Western Ave.
“Michael Manfredi” happens to be the name used by the troll who was posting comments on my site for a time but who has now been silent for more than three months. I’d noted the Michael-Manfredi-as-New-York-architect angle back in June but didn’t know until I saw today’s Times article that the architect Manfredi was working on the Olympic Sculpture Park. Surely a world-famous New York architect wouldn’t bother with my little site even while he was in Seattle several times during the project? And while it’s possible said New York architect would stay in the Bremerton area during his visits, surely he wouldn’t be charged by his supervisor (!) to monitor and comment on a dinky little site like mine? The mind just boggles. If it is in fact the architect, I feel blessed that he was ever taking time away from 26 redesigns of the park’s door handles to have a look at my writing and offer spurious (and usually poorly written) advice. 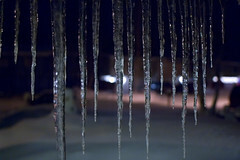 Flickr: djwudidjwudi’s photos of icicles from his recent trip to Anchorage remind me of the eaves on the west side of Mom’s house in Salt Lake City. 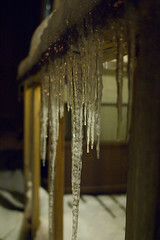 Every year we’d see huge icicles build up on that side of the house. The roof had a problem that created an ice dam, and the water would drip slowly down, extending the icicles until in some cases they were seven or eight feet long. Every few days we would go outside with the snow shovels and bang them against the icicles to knock them down. We’d swing the shovels and jump back as the ice cracked and gave way to shatter into thousands of pieces on the concrete. Sometimes we would end up with two- or three-foot pieces of ice, and we’d play at swords or spear-throwing until even those larger pieces were reduced to shards. We only had to wait for another couple of days before the ice would return, starting the cycle anew.